It’s been a tumultuous few years for Oriol Junqueras, the Catalan professor who became vice-president of a government that tried to break away from Spain, and who is now preparing to take centre-stage at a major trial. The paunchy politician could face 25 years in prison for his role in Catalonia’s 2017 secession bid. As the main protagonist of the high-profile trial that opens Tuesday in the absence of former Catalan president Carles Puigdemont, who left Spain, Junqueras is one of 12 independence leaders in the dock. ‘He’s become friends with a number of people who are in prison for various reasons … drug trafficking, murder, robberies,’ Murcia said. ‘We won’t renounce any democratic and peaceful method to get a Catalan republic,’ the father-of-two told a gathering last month in Barcelona. He didn’t speak directly to the audience, of course. A hologram of Junqueras making a speech in his pre-prison days was beamed on stage as people nearby read comments he wrote from behind bars. Born on 11 April 1969 in Barcelona, Junqueras was educated at an Italian religious school. The affable Junqueras, described as a ‘teddy bear’ by opposition figure Miquel Iceta, became vice-president of Catalonia in January 2016. Known for skirting journalists’ questions, he commands loyalty but remains inscrutable. ‘Despite days and days of conversations with him, I still question who Oriol Junqueras really is and what his personal and political project is for Catalonia,’ Santi Vila, one of his former government colleagues, wrote in his book. Regardless, Junqueras was seen as the more pragmatic voice to Puigdemont’s staunch idealism. Enric Millo, who was Madrid’s representative in Catalonia during the 2017 crisis and had frequent dealings with Junqueras, said he had initially hoped to negotiate a solution. ‘He would suggest possible solutions and I would too,’ he recalled, adding that Junqueras told him he was in no rush to achieve independence, knowing that a precipitous move would have dramatic consequences. ‘But as time went by, we realised it wasn’t possible. That actually Junqueras was ready to go all the way,’ Millo said, accusing him of being ‘two-faced’. On 1 October 2017, the independence referendum took place, marred by police violence. According to Santi Vila’s incredulous account, Junqueras the moderate did not help Puigdemont make that move and thus failed him in a ‘spectacular’ way. 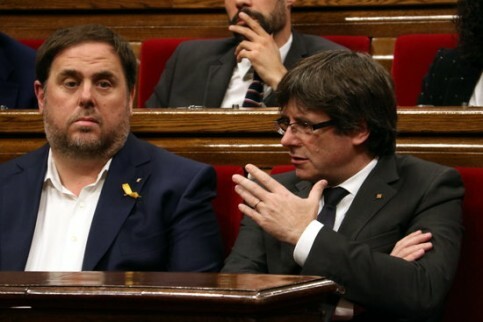 It is widely believed that by then, neither Junqueras nor Puigdemont wanted to be labelled ‘traitors’ to the independence movement by calling elections. So it was that on 27 October, the majority-separatist Catalan parliament declared independence from the rest of Spain and Madrid promptly ousted the regional executive. Several days later, Puigdemont and several others left for Belgium. Junqueras chose to remain ‘because of his responsibility towards fellow citizens and also a little for his family,’ said Murcia.